The Belgians have given plenty of culinary gifts to the world--their chocolates, their waffles, their beer. But perhaps the one they get the least credit for is their version of french fries. That's something Florida businessman Scott Nelowet would like to change. His French Fry Heaven franchise, with nine stores open and 40 more in development, seeks to expose America to Belgian-style frites, a snack Nelowet hopes will soon be as common as chips and salsa. Nelowet didn't start out with the intention of remaking America's fast-food landscape. He had worked in academic administration for 20 years and was looking for a business to import when he and his wife took a trip to Europe in 2010. "We wanted to find something Europeans do really well that we could bring home," he says. "In northern Europe, we saw people eating fries everywhere. There were even fry stands in alleys." 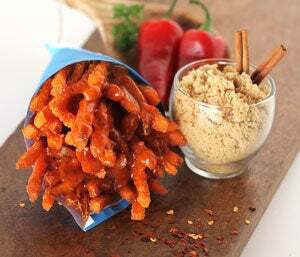 Nelowet began experimenting with the concept at home, eventually selling his Belgian fries with dozens of toppings at local fairs and festivals before launching French Fry Heaven. He shut down the deep fryer to tell us how things are going. What makes your fries so special? Belgian-style means you cook the fries once, so they are three quarters of the way done. They come out like limp fast-food fries. Then you let them cool and drop them in the oil again for about 90 seconds when the customer places an order. They come out very crunchy on the outside and soft on the inside. They aren't oily, and they taste better. How did you get involved in franchising? We just wanted to open one store and make some money on the side, but three months into it, we had a stack of cards 3 inches high from people wanting to franchise our business. We were almost forced into it. There was a couple from St. Augustine [Florida] who visited us four times, then leased space and pressed us to start franchising. At the same time, the people from the mall we were in asked us if we'd sign a national deal. They did a study, and even though malls had seen big dips during the recession, the six stores closest to our stand saw a 13 percent increase! Isn't running a fryer all day messy? We have a proprietary machine with a hoodless, ventless system. It gives off very little fry smell and no grease. It was an off-the-shelf fryer that we had a company in Germany modify. It cooks twice as fast as a regular fryer. When they're cooked, we throw the fries in a bowl, salt them, flip them in the air, put them in a paper cone, squirt on the sauce and there you go! You've got some wacky flavors. Yes, we have 50 different flavors. We went all around the world looking at things people put on fries or potatoes. So we have toppings like ghost pepper, poutine, garlic parmesan, Cajun rémoulade and dessert flavors such as funnel cake or blueberry. Are there any flavors that don't work? For some reason, chocolate on sweet potatoes is just awful.